The George Blumenthal residence designed by Trowbridge & Livingston c. 1916 at 50 East 70th Street in New York City. Blumenthal was a financier and president of the Metropolitan Museum of Art. Blumenthal willed the house to the museum which used it briefly before selling it (which Blumenthal had specified). The residence was demolished in the late 1940s. Photo from the Museum of the City of New York. And there, peeking out of the background, is the Arthur Curtiss James house. 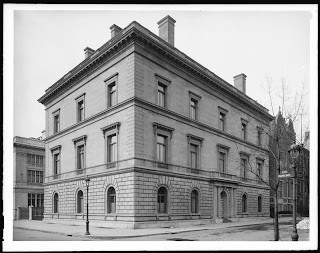 Amazing to think this staid exterior once masked the Blumenthal Court now at the Met. When one ponders these houses, one fully appreciates how little bang today's oligarchs and plutocrats are getting for their money when they buy one of those 88 million dollar apartments. superb even down to the undersea murals in the art-deco swimming pool in the basement, The medieval dining room was also built with original antique fittings and furniture, as were most of the other rooms in the house. The entire bedroom floor seems to have been done in the 18th century French style with beautiful paneling. The bathrooms rivaled "Shadow Lawn's"(NJ) marble bathrooms.